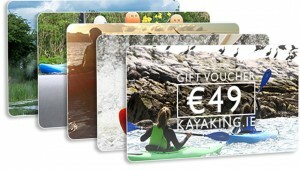 LOOKING TO KAYAK IN DUBLIN? Come and join us on the water for an unforgettable kayaking experience in Dublin. Our tours and courses are suitable for beginners. We welcome groups and individuals. All of the gear and equipment is provided and it's great fun. Please click the images below for information, locations and prices or you can scroll through our menu. You can even book online! The tour is very well organised and all the crew are friendly and supportive. Jenny was a great leader, ensuring that everyone was keeping up and could hear her speak about each area we kayaked through. We spend a lot of time in Dalkey but this was a really different view! The seals were so cool and very curious - one followed us right back to the harbor! We will definitely do this again and recommend for all visitors to Dublin. My birthday was on Sunday, and me, my sister, my husband, his cousin, and the cousin's wife were in Dublin on a little family vacation and this was the activity chosen to celebrate my most recent trip around the sun! We've had some amazing adventures abroad over the years, both as a group and separately, but hands down, kayaking in Dalkey was THE BEST thing any of us have ever done overseas!